Side A. 1. Caribbean Cruise; 2. The Island; 3. Selfietime; 4. Spong; 5. Dogfight; 6. Desert Mushrooms; 7. Admirals Lullaby. Side B. 8. Inspector; 9. All Inclusive; 10. Joses Rythms; 11. Diamonds; 12. Dance of the Geisha; 13. Lovetune; 14. Fiasco Tours. Simon Eskildsen: organ/synth; Daniel Sommer: drums; Scott Westh: trumpet (8, 11, 12); Marc Dania: saxophone (11, 12); Cesar Joaniquet: saxophone (5, 11); Jens Balder: trombone (13). Hr & Fru OrgelDuo Travels the World! 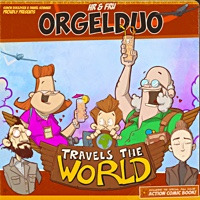 Vinyl & Comicbook Hr og Fru OrgelDuo Travels the World is the debut album of the danish band OrgelDuo. Armed with drums and a hammond organ, the masterminds Daniel Sommer and Simon Eskildsen want to guide listeners and readers in their new homemade universe. The two musicians have created an audio-visual experience which tells the story of two retired Danes from a small suburb. Under the names Hr & Fru OrganDuo they travel the world - going on adventures, getting themselves in hairy situations and meeting plenty of exciting people... Simon Eskildsen and Daniel Sommer are both professional musicians with several critical acclimated albums behind them. Now they are investigating and developing the Organduo format. And creating their universe with a homemade comic book. The music consists of composed material and short intermezzos - all gathered in a beautiful gatefold along with the full color comic book to make the album a perfect whole. Even though it seems quite silly, there is a love and dedication to the music and life of the Orgelduos that goes deeper with us. We have spent years with these guys already, and find that they help guide us through the landscape of musical expression.